As a school we are committed to ensuring that our young people are empowered by their rights. Since January 2018 the school has been working towards becoming a Rights Respecting School which is a recognised award from UNICEF UK which ensures that schools actively promote the rights of a child. Over the coming months the school will work to redevelop its policies by putting the rights of the child at the heart of the policies. In lessons and throughout the school day students will explore their rights and what they mean to them and their peers. You can find out more information by watching the videos on this page and downloading the information. 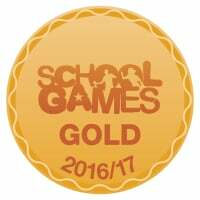 Look out for more information coming soon about how the school is continuing its journey to bronze status. As part of our commitment to becoming a Rights Respecting School the students developed their own school charter which underpins the school’s ethos, values and expectations of students, staff and carers. The students selected the three articles through a whole school vote and then stated what they expect from each other and staff throughout the school. 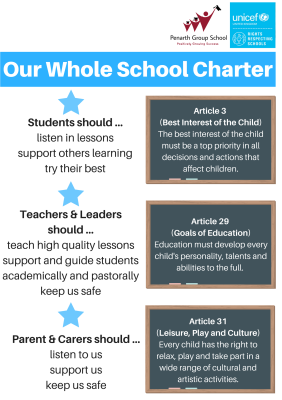 Our charter states that article 3, 29 and 31 should underpin the school’s values and ethos. Students have asked that when ever decisions are made that it is always made with the best interest of the said student or students. Article 29 was chosen by all students which they said meant that the school should ensure its curriculum develops every student’s talents, personality and abilities and ensure that lessons are fun, engaging and interesting. Students also recognised that leisure, play and culture are important to them and want the school to maintain and extend its offer where possible to ensure students are happy and healthy both mentally and physically. The students also designed their own expectations for themselves, staff and carers. Students said that they want all students to try their best in lessons, listen and support each other. Teachers and staff including school leaders such as the governing body should ensure that lessons are of high quality, that staff are always supportive and keep them safe. Students said they wanted their parents and carers to be more involved in school and they expect them to listen, support and keep them safe. Each term the school will come together and choose one article to focus on for that term. In lessons students will explore the right in a way related to that subject and topic. In tutor time they will explore and apply the right by planning assemblies, projects or charity days for example. 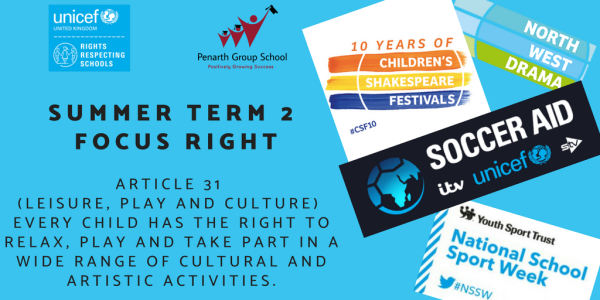 During summer term 2 we will be exploring Article 31 Leisure, Play and Culture. This article fits in nicely as during the summer term we will be completing our performing arts project about Hamlet with North West Drama, taking part in Soccer Aid, celebrating the football World Cup and much more.